Vegan Maple Cupcakes with Creamy Maple Frosting! I'm not sure why I forgot to post this recipe, but it was one of my favorite from the Vegan Cupcakes Take Over The World cookbook. On the sweet side, it's the perfect flavor profile for the fall season coming up with a lovely nuttiness and spice. The frosting in this photo was just spread on, and then with a small spoon I used the back of it to pull up the frosting in little bits. I wanted to have a less-perfect look, making you just want to sink your teeth into them! 1. Preheat oven to 275 F. Spread the walnuts on a rimmed baking sheet and toast in the oven for 6 to 8 minutes. Open oven and shake the pan after about 4 minutes. Watch carefully so as not to burn! Remove from oven and place in a bowl to cool. Lightly grease a large piece of parchment paper and have it ready because you will need it at the end of the next step. 2. Pour sugar, maple syrup, and salt into a large, cold, heavy-bottom skillet. Turn heat to medium and stir with a wooden spoon until sugar starts to melt and bubble, about 5 minutes. Continue stirring and cook another 3 to 4 minutes until the mixture is thick, amber-brown, and smells like caramel. Remove from heat and quickly stir in the walnuts and cinnamon, stirring to coat each nut. Immediately spread coated walnuts on greased parchment paper, using a spatula to spread out the nuts and avoid forming large clusters. Allow to cool completely on sheet before handling or eating. 1. Preheat oven to 350 F. Line a muffin pan with cupcake liners. 2. Whisk together the soy milk and vinegar in a large bowl; set aside and allow to curdle for a few minutes. 3. Sift the flour, baking powder, baking soda, salt, and nutmeg into a separate bowl and mix. Whisk the maple syrup, oil, brown sugar, and vanilla, and maple extract into the soy milk mixture. Form a well in the dry ingredients and pour in wet ingredients, stirring until large lumps are gone; fold in chopped sugared walnuts. Fill cupcake liners two-thirds of the way. Bake 20 to 22 minutes. DO NOT OPEN OVEN WHILE BAKING, CUPCAKES WILL FALL! Transfer to cooling racks to cool completely. 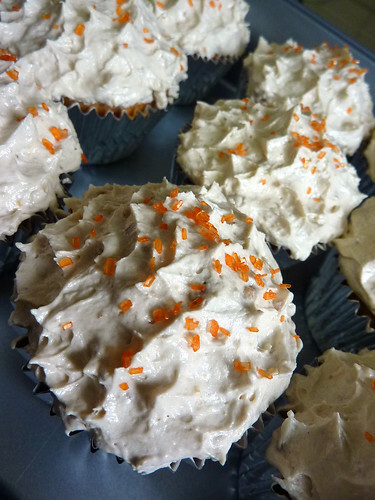 Frost with Creamy Maple Frosting and sprinkle with Sugared Walnuts or sprinkles (in my case). Beat Together the softened margarine and maple syrup. It might look a little curdled but that's okay. Beat in the vanilla and the maple extract, then slowly add soy milk powder a little bit at a time. The frosting should be creamy and fluffy. If it looks too wet, add a little more soy milk powder, if too stiff, drizzle in a little more maple syrup. The frosting can be stored in fridge until ready to use, just allow to sit at room temperature 10 minutes to soften. WARNING: Spoiler alert if you have been watching "The Next Food Network Star." I am so ecstatic that Food Network picked a winner this time who has such a vibrant personality and isn't afraid to introduce us to a plethora of spices and color! Aarti Sequeira reminds me of all the Indian friends I grew up with in Vancouver, B.C., whose kitchens smelled like heaven every time I walked through the door, warm spices wafting throughout the house. She's got such an infectious giggle, a great smile, and isn't afraid to speak the truth in her point of view and life experiences. Aarti is like the Indian Ina Garten cooking with ease and comparing ingredients to things we might be familiar with but also teaching us about all the spices that are out there we should be using. Indian cooking doesn't have to be intimidating, and can be totally fun to make. Imagine the smells and flavors that can come out of your kitchen...mmm! Her show Aarti Party will be on every Sunday at noon, so check it out! I can't wait to try those Creamy Pistachio Pops she made today! So sorry I've been out of touch here on the ol' food blog. I have been in the middle of house hunting, and we're on the verge of purchasing so things have been quite hectic. I have also been post processing a bunch of wedding photos for friends so that takes up a lot of free time as well. In the meantime, I had a totally delicious lunch at the Cherry Street Coffee House (for the millionth time, no doubt). They had their rice, lemon, and egg soup which is just the perfect bowl of goodness to nurse a cold I have had the last few days, accompanied with a half sandwich of ham and cheddar with all the fixings! 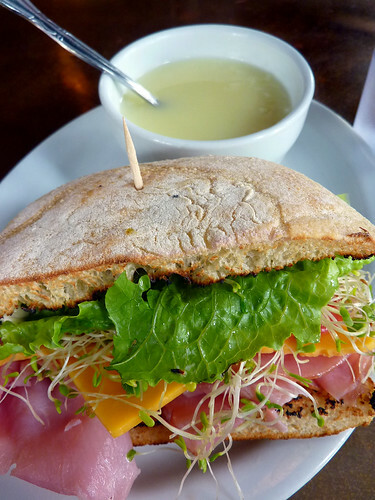 If you are ever in Seattle and want a delicious fresh lunch please check out their multiple locations downtown! Also some of you might recognize the photos on their website, and that is because I had the complete pleasure of taking photos for their new menu! I think it turned out pretty well! Thank you AJ and crew!